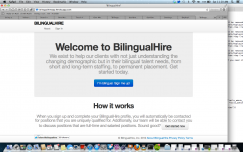 Founder and CEO at BilingualHire, Inc.
A few years ago, we were approached by a university who was looking for an administrator that was bilingual in Spanish and could grow with the organization. We knew just the right person. That was in 2004. We conducted the search and helped someone's career grow. No website, nothing. It was the most inspiring work we did fresh out of college. Help an organization fill a need, and help someone start their career. But what if there was a simpler way for this same university and thousands of others, including private, not-profit and government organizations to fill bilingual talent needs? What if there was a way for bilingual talent to be in control of their own work, schedule and assignments? To something that is more enjoyable, efficient and seamless for all parties involved. If you are interested in learning more and/or get engaged, tweet us: @bilingualhire or @davidcmolina (founder/ceo). We look forward to your feedback and comments. Thanks Mattan for the awesome course and all the students who asked, answered questions. Super helpful.